Fauré's En Prière has been arranged for viola solo and piano by the world-famous violist Donald McInnes, who held a professorship at the University of Southern California from 1985 to 2014 and is known in virtually every corner of the artistic world for his appearances with major orchestras, recitals, chamber music participation, and numerous master classes. Gabriel Fauré’s En Prière, or In Prayer, is a beautifully poetic song written in 1890 and based on the text of a devotional poem by Stéphan Bordèse. Stylistically and textually, En Prière is a musical glimpse into the prayer of a sincere believer, allowing listeners to peer into ordinarily private thoughts and emotions. The delicate yet intense melodic line is supported, even sheltered, by the piano’s repetitive triplets. 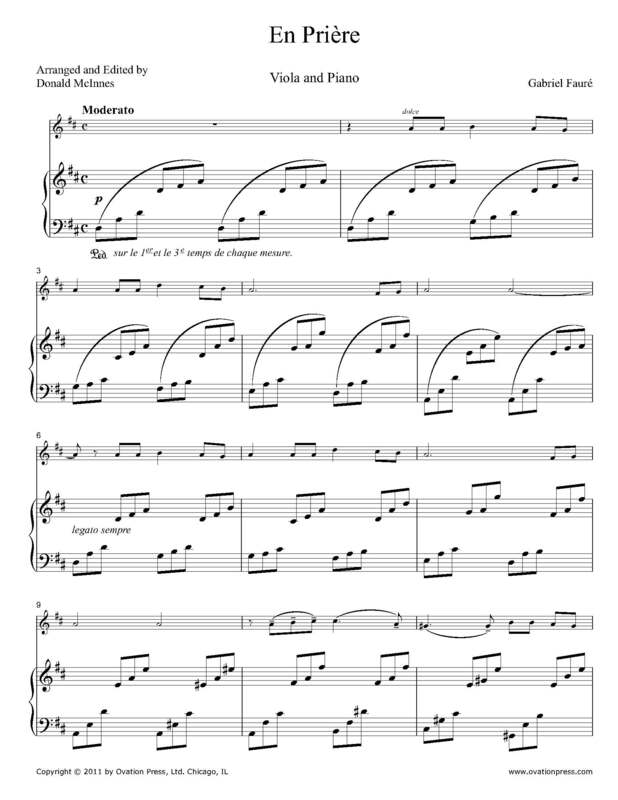 Download and print the score today to gain access to this expertly edited arrangement of Fauré's En Prière for viola and piano by Donald McInnes!